The Dolphin Gas Project is one of the largest trans-border energy projects ever undertaken in the Middle East. The project brings natural gas from Qatar via pipeline to meet the growing energy needs of the United Arab Emirates (UAE). The $7bn project has brought together three Gulf Cooperation Council (GCC) nations – UAE, Qatar and Oman – into an integrated regional energy network for the first time. The first phase involved the development of two platforms in Qatar’s North field, two multi-phase offshore sealines to the processing facilities and the gas treatment and compression plants at Ras Laffan. The second phase involved the construction of a 48in diameter, 260 mile (364km) subsea pipeline that carries gas to the UAE (cost $3.5bn). The second phase was completed in August 2006. The pipeline carried the first gas in 2007 and can carry up to two billion cubic feet of Qatar natural gas a day to the UAE for a period of 25 years. It also has the capacity to transport up to 3.2 billion cubic feet a day and as a result additional customers are being booked. Dolphin Energy is the constructor and operator of the project. Dolphin Energy is owned 51% by Mubadala Development Company on behalf of the Government of Abu Dhabi and 24.5% each by Total of France and Occidental Petroleum of the US. The project, which has been underway since 2001, came onstream in late 2006. In January 2004 the engineer, procure and construct (EPC) contract for the gas processing and compression plant at Ras Laffan was awarded to JGC Middle East FZE, a wholly owned subsidiary of JGC Corporation of Japan. The plant came online in late 2006. 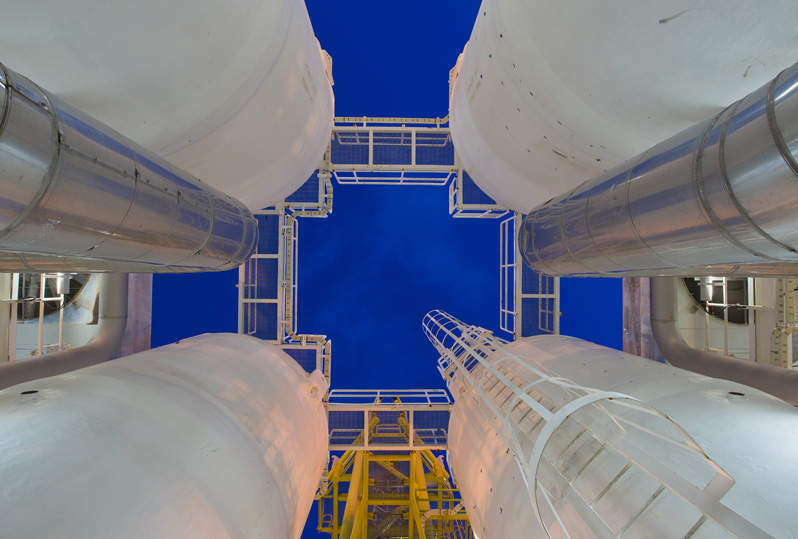 The plant receives wet gas from North field and removes valuable hydrocarbon liquids (including condensate and NGL products) for processing, marketing and spot sale. The plant compresses the resulting dry gas for transportation through the export pipeline to the UAE. The JGC contract also includes commissioning and start-up, training of operations staff and maintenance. The six compression trains at the facility are driven by 52MW gas turbines that were supplied and commissioned by Rolls-Royce Energy Systems of the UK. The plant can compress over two billion cubic feet (57 million cubic metres) of methane a day. The propane, butane and condensate are sold on the open market, but the ethane is supplied to Qatar Petroleum. The Dolphin Plant Automation Applications and Systems (PAA / PAS) implementation project was awarded to Honeywell Middle East and its main subcontractor Trust Technical Services in 2006. The pipeline management system one (sea lines) contract was awarded to Scand Power, the pipeline management system two (export and distribution pipelines) contract was awarded to Energy Solutions along with the gas distribution management system contract. The upstream FEED contract was awarded to Foster Wheeler Sofresid. Design and planning work began in Paris during January 2002 and was completed in May 2003. The scope of work included FEED for the offshore production complexes, the two multiphase sea lines transporting the wet gas to shore, the onshore receiving facilities, separation, gas processing and export gas compression facilities. The first appraisal well in Qatar’s North field, NFD 1, spudded on 5 December 2001 in 40ft–50ft of water; the well was completed at 11,018ft in April 2002. Successful testing of pressures and flow rates was completed during July 2002. The second appraisal well, NFD 2, was spudded on 8 April 2002 and was completed in June at a depth of 10,331ft. Successful testing was conducted during July and August 2002. A total of 24 wells were drilled during 2005 and 2006 to provide the necessary quantities of raw gas to meet Dolphin’s requirements. In January 2004 the EPC contract for the two offshore platforms was awarded to J Ray McDermott Middle East, and involved fabrication, installation and connection of the offshore production platforms to the sealines. In April 2004 the EPC Contract for the sealines was awarded to Saipem (Italy) a subsidiary of the Eni Group. The contract included engineering and installation of two 36in diameter concrete-coated sealines, which transports the production stream (natural gas, hydrocarbon liquids) from the wellheads to the Ras Laffan processing plant. The twin sealines were laid during early 2006. They transport the unprocessed natural gas and hydrocarbon liquids from the offshore platforms to the processing plant, 80km away. The first gas from the North field wells was produced on 25 June 2007. The EPC (design and installation) contract for the 364km subsea pipeline from Qatar to the UAE was awarded to Saipem (Italy) in March 2004. The pipeline is 48in in diameter, with a capacity of 3.2 billion cubic feet of natural gas a day. The pipeline exports natural gas between the gas processing plant at Ras Laffan and the receiving facilities terminal at Taweelah in the UAE. The line was laid during spring and early summer of 2006. Mitsui $ Company of Japan was awarded a contract for procurement of the line pipe for the project in January 2003. There were several objections from Saudi Arabia over the pipeline because of an ongoing border dispute with Qatar. The contract involved the supply of over 400,000t of high-quality carbon steel line pipe which was manufactured and delivered by 2005. Fugro Middle East carried out the necessary surveys for the project. In November 2004 the EPC contract for the gas receiving facilities at Taweelah was awarded to Technip (Abu Dhabi) and Al Jaber Energy Services Consortium of the UAE. The facilities were constructed adjacent to the Taweelah Power Station. They comprise three parallel gas-receiving trains and associated equipment, metering facilities, control buildings and warehouses and interconnecting pipelines to the Taweelah Power Stations and to the existing Maqta-Jebel Ali Pipeline. The facility was completed in early 2006. The contract’s value was in excess of $62m. A new 24in pipeline (118 miles long) was constructed from Al-Ain to Fujairah as a separate project and was completed in December 2003. Emirates General Petroleum Corporation (Emarat) managed operations and maintenance for the pipeline from January 2004 to December 2005 (Dolphin assumed control in January 2006).The pipeline can carry 20 billion cubic metres of natural gas a year. Dolphin Energy started supplying Omani natural gas to the 656MW power generation plant and the 100 million gallons a day desalination plant of Union Water and Electricity Company (UWEC) in Fujairah in January 2004. The gas was delivered via a tie-in near Qidfa between the Al Ain–Fujairah pipeline and the existing Emarat gas pipeline network. This has been replaced with Dolphin Gas from Qatar by October 2008 (200 million cubic feet a day). This is a 240km (149 mile), 48in pipeline to run between Taweelah gas receiving station and Fujairah. The new gas supply is required as for the $2.8bn Fujairah F2 power and water desalination plant that is being developed by International Power PLC and Marubeni Corp for Abu Dhabi Water and Electricity Authority. The new F2 plant has been designed with the capacity to produce 2,000MW of electricity and 130 million gallons of water a day by the final quarter of 2010. A tender was put out for the design and construction work on the new pipeline in late 2007 and nine companies have been asked to submit bids. These companies included: Al Jaber Energy of UAE, Consolidated Contractors Company of Greece, CPECC of China; Dodsal of India, Petrojet of Egypt, Snamprogetti of Italy (Saipem), STG of Russia; Techint of Saudi Arabia and Technip of Germany. The final bids were due in by the end of January 2008 and following this a shortlist of five companies (Al Jaber Energy Services, Consolidated Contractors Company International, Dodsal, Stroytransgaz and Snamprogetti (Saipem)) was produced. They were asked to resubmit design and construction bids by May 2008. In July 2008 the construction contract was awarded to Stroytransgaz PJSC of Russia. The contract was valued at $418m. The pipeline material will consist of coated pipe sections, which will be supplied by Salzgitter Mannesmann International (200,000t of pipe in a $200m contract). Construction began in March 2009. The second phase of the pipeline was completed in May 2010 and operations began on the 128km section. In May 2006 two EPC contracts for the forthcoming Eastern Gas Distribution System (EGDS) in the UAE were awarded. The first contract for the east and west facilities went to Consolidated Contractors Company (CCC), which covers engineering, procurement and construction of civil, pipelines, mechanical, SCADA, telecommunication and electrical works with respect to expanding, modifying and upgrading the existing eastern gas-distribution system; and construction of the new Dolphin operations / administration building and expanding the control building at Al Ain gas terminal. Punj Lloyd was awarded the civil and fibre optic cable EPC contract. The project was completed in November 2008. The upgrade of the existing EGDS has enabled Dolphin to deliver its gas to its customers in Abu Dhabi, Dubai and the Northern Emirates.